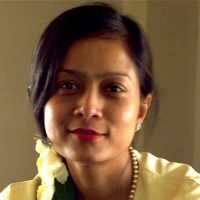 Khin Sanda Win is the founder and managing director of the Sanda Hotel & Services. With 24 years of experience in Hospitality & Tourism Industry in Myanmar, the company is successfully operating 3 boutiques hotels, 2 restaurants and one French-Myanmar joint-venture inbound travel agent together with several others hotel and service apartment project across the country. The Loft hotel (Yangon) , Inle Lake View Resort & Spa , Bagan Eco lodge are the one of the best and well known hotel and resort in Myanmar according to Trip Advisor record . Sanda Hotel & Service is not only an investment company in hotel and tourism industry but also an institution to train the young people from remote areas to be able to work in hospitality. Currently building vocational Hospitality training school in Bagan, Mandaly Divison to train the most unfortunate young people within the region. In 2003, she was invited by United State Department and chosen to participate in International Visitor Leadership Program in United State for 3 weeks meeting with business and political leaders in 5 different state. In 2015, She become a chairwomen for the Myanmar Business Forum for hospitality and tourism Industry. Purpose of the forum is to find solution to reduce the business risk for private sector and reporting to the related Ministry as well as to President Office. In 2016 , she received a national award from French President for the all the outstanding contribution toward society and economic development in Myanmar.